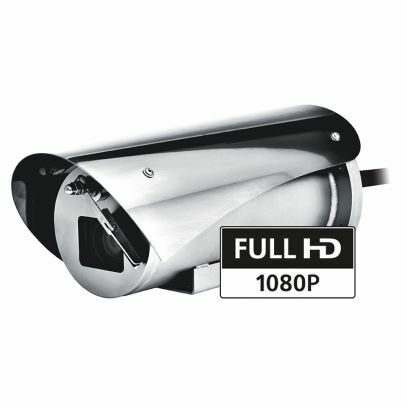 The Full HD explosion-protected MAXIMUS MVXHD is perfect for effective video surveillance and process control in harsh settings where the presence of gases or flammable dust can create a potentially explosive environment, a reality often found in the oil and gas industries or marine and industrial sectors. The Full HD, 1080p, 60fps, MVXHD camera with 10x or 30x motorised zoom lens for easier setup, offers multiple video streams (H.264/AVC or MJPEG) and provides exceptional image quality, picking out every detail in a scene, even in the harshest environmental conditions. One striking advantage offered by these cameras is their extremely easy and secure “plug and play” installation, with multipolar wiring. These cameras arrive ready to use, avoiding the complex electrical connections that are typical of this type of device. The housing is compact yet functional and is made entirely out of AISI316L stainless steel. Its resistance to corrosion is not only guaranteed, but is also enhanced by way of polishing processes. Another important feature of the camera is the extended certification temperature range of -60°C to 65°C, along with a sophisticated cold start system, which allows it to operate in harsh environments as standard. An equally noteworthy point is that the IP66/IP67/IP68 ratings guarantee the complete protection against harsh weather and submersion in up to 5 metres of water for 2 hours. Moreover, the IP69 rating allows the device to be cleaned with high pressure water jets. These cameras come with wipers and an explosion-proof washer kit is also available, allowing for flawless, maintenance-free cleaning of the front glass.